A. Converging Lens: Notice how incident rays parallel to the principal axis converge through the focal point. Also, rays that enter through the focal point exit the lens parallel to the principal axis. 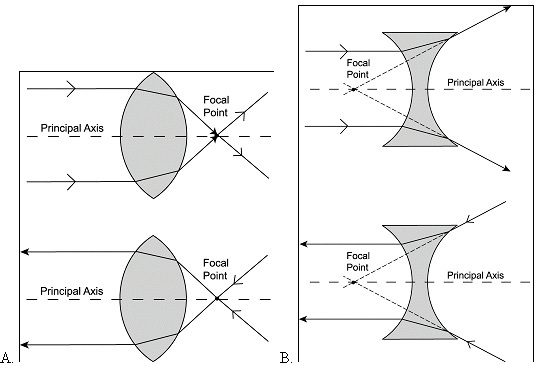 B. Diverging Lens: Notice how the incident rays traveling parallel to the principal axis refract through the lens in such a way as to diverge in a path in line with the focal point. Also, rays entering toward the focal point refract such that they then travel parallel to the principal axis.